You suddenly find yourself needing a product, maybe a certain pair of shoes. On your laptop, you check out your favourite fashion shop and note they have just the pair you want. However, you decide to visit their brick-and-mortar store to try on sizes. Once there, you can’t seem to find the shoes in your size so you of course ask the in-store sales assistant for help, who tells you that they are sold out. I bet most consumers have tried something similar. And I bet most have walked out of that store without buying anything. But why is it that that hardly ever happens? That is because most businesses still lack the ability to fully execute omni-channel strategies. They can’t deliver a seamless customer experience integrating all available shopping channels, for example, mobile devices, online, brick-and-mortar stores, catalog and so on, even though the shopping habits of today’s consumers’ call for it. Today, consumers who are faced with an empty shelf rarely wait until an item is stocked back in the store.. Most likely, the product is purchased in another store or from another brand, obviously causing a loss of sale. Consequences can be detrimental if the customer finds the desired product through your competitors, and if she has a good shopping experience, it is highly likely that she will choose the competitor over you next time. What’s the point in having a great webshop and superb brick-and-mortar stores if they are not aligned? 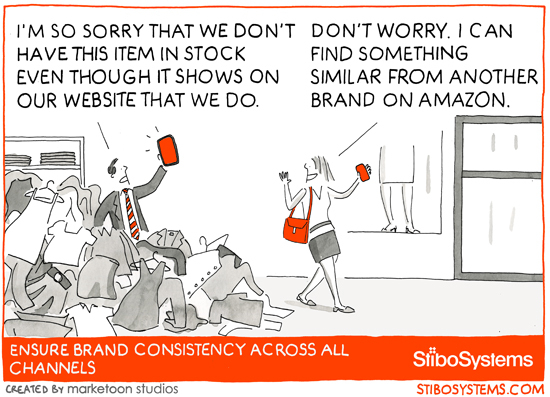 Consumers think of your brand, not channels within your brand. If you want to attain their loyalty, you need to allow consumers to experience your brand as being one functional company. The best way to do this is to connect all domains, including warehouses and suppliers, into one single system that enables product sharing across domains and ensures consistent and correct information in all your sales and communication channels. A recent study from Accenture shows that although consumers do shop and compare brands and products online, physical stores still play a crucial role. Not only for showrooming (buying online after browsing at a store) – a trend that in recent years has been named the number one retail challenge. In fact, the survey shows that consumers did more webrooming (buying in-store after browsing online - 78%) than showrooming (72%) in the past year. Furthermore, 21 percent of the surveyed shoppers said they plan to increase their in-store purchasing, up from just nine percent of shoppers in the previous year. The conclusion is that the in-store customer experience can simply not be under prioritised, leading me to my third point. "Consumers have never been more accessible via social media and online interaction." This is one of the newer retail doctrines. But there are consumers who are even more accessible; those who visit your store. Especially those who actually seek to buy one of your products. Therefore, do not let them go “bootless.” Close the deal while you have them in-store, on the phone, or via online chat etc. Educate in-store staff and support them with relevant, real-time information about products, upcoming campaigns, etc. Give staff access to a central system that allows them to properly inform customers about products and the ways in which they can receive them. With a Master Data Management (MDM) solution, companies can realise both omni-channel strategies and high customer service standards while improving efficiency, speeding up time-to-market and reducing costly errors. A MDM solution gives you a real-time overview of products in-store, warehouses and inventory that allows you to share that information internally and externally. That is the best way to give customers consistent and correct information across all sales channels and to gain customer loyalty. In other words, a MDM solution lets your customers experience your brand, not your channels. What Is Effective Product Information?